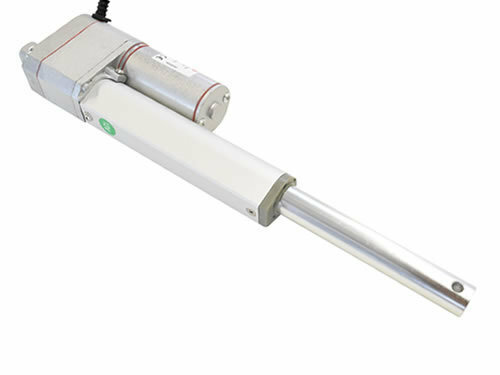 The GLA750-P is similar in build style to our GLA750 model actuator but also features an internal 10KΩ potentiometer (variable resistor) connected to the lead-screw such that the position of the actuator can be determined. This enables the actuator to be used in applications where precise (up to +/-1mm) position control is needed, or where a position read-out is to be added. 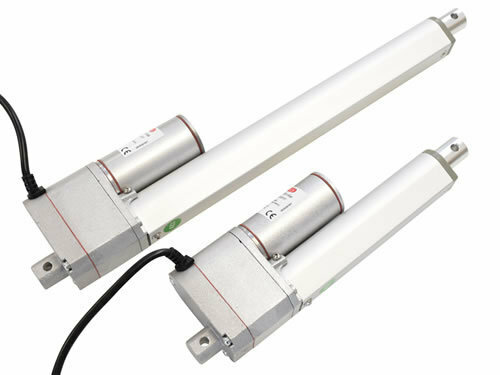 100mm and 250mm sizes of this actuator model are available. 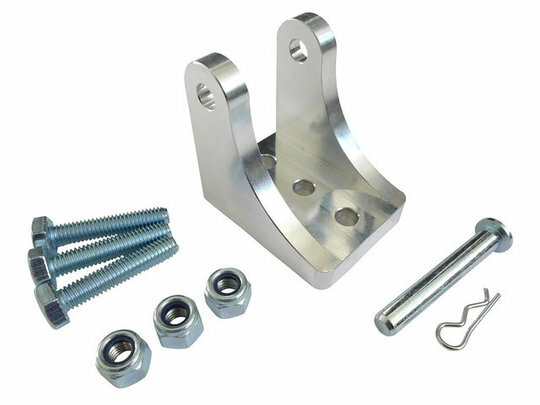 The rated load is 750N (76kg) and the speed is 10mm/s unloaded and 8mm/s at the full rated load. 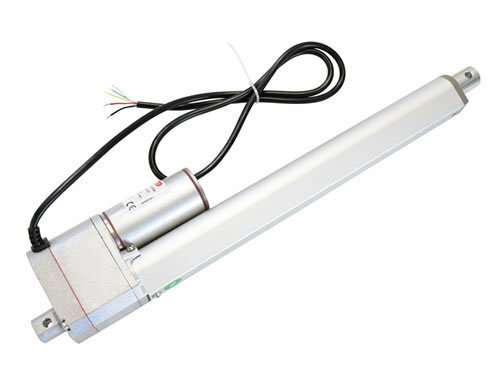 The actuator comes with a 0.8m long PVC-insulated lead as standard (black external sleeve with five internal cores, one Red and one Black which are connected to the motor and three additional White, Blue and Yellow cores connected to the potentiometer). Use a multimeter or similar device to measure the resistance across the three potentiometer leads (testing the leads in pairs) at the fully retracted and fully extended positions, you can then assume that the resistance will change linearly with extension distance between these values. The blue lead is connected to the potentiometer wiper and yellow and white across the potentiometer. 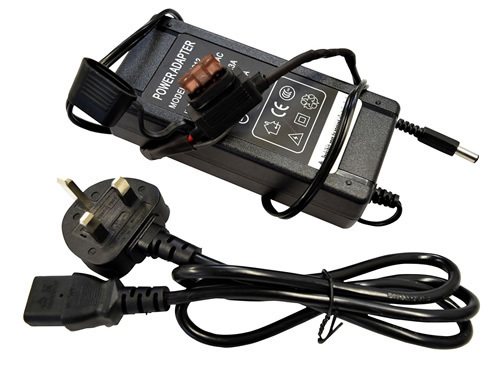 To change the direction of travel simply swap the polarity of the DC power source to the two red and black actuator leads. By varying the input voltage between 0-12V DC it is possible to control the speed of the actuator. 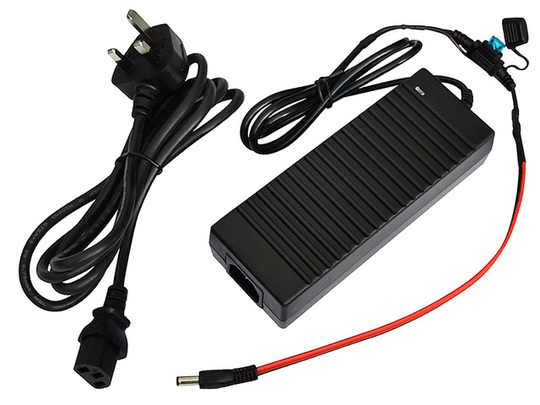 Reducing the voltage will also reduce load capacity (for example at 6V the actuator will have roughly half of the maximum load capacity at 12V). As with any DC motor the motor may be run at a higher voltage than the nominal 12V DC however operation at higher voltages will invalidate the warranty. 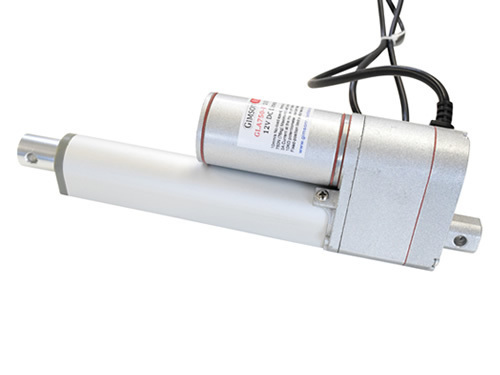 Experienced users who wish to extract greater power from the actuator (at their own risk) should abide by a practical operation ceiling of 18V, above which the motor, diodes and limit switches of the actuator would be significantly more likely to fail. Be aware that the current draw will be greater if the actuator is run at above 12V DC and the duty cycle should be reduced to help avoid over-heating. 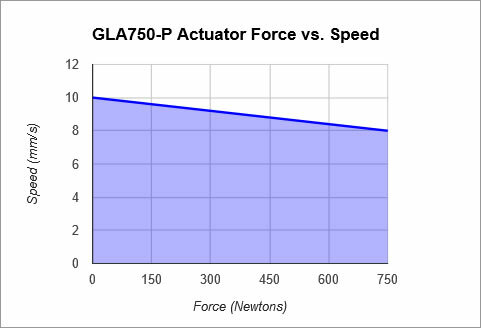 The shallow lead-angle of the GLA750-P model means that if the actuator is driven into a position it will stay in that position unless power is applied again or unless it is subjected to a load much larger than the rated load. CAD models (STEP or IGS) of the actuator are available upon request. Read on below for more product information. This is the distance from the front to rear mounting hole centres when the actuator is retracted. Add the stroke length to the installation length to get the fully extended hole-to-hole centre distance. Mounting: Two 6mm holes. One is towards the end of the piston rod, the other is on the rear of the gearbox housing. Body material: Aluminium & Zinc plated Steel, rated to IP54. Gearbox type: 30:1, three-stage spur gears, all-metal. If you have any queries about this item, including requests for bulk-pricing information, then please contact us.